Working with Special Orders in Artisan POS 4 is an integral part of many retail operations. It is very important to understand the proper steps in order to keep your orders organized, efficient and correct. Keeping track of customer deposits, payments, and balances due. Prompt purchasing staff to order merchandise on behalf of a customer. Prompt receiving staff when something has been received that was promised to a customer. Having lists of special orders at each stage in the process so that followup can be made as needed. For example, you can see or print a list of special orders that are ready for the customer to come pickup. 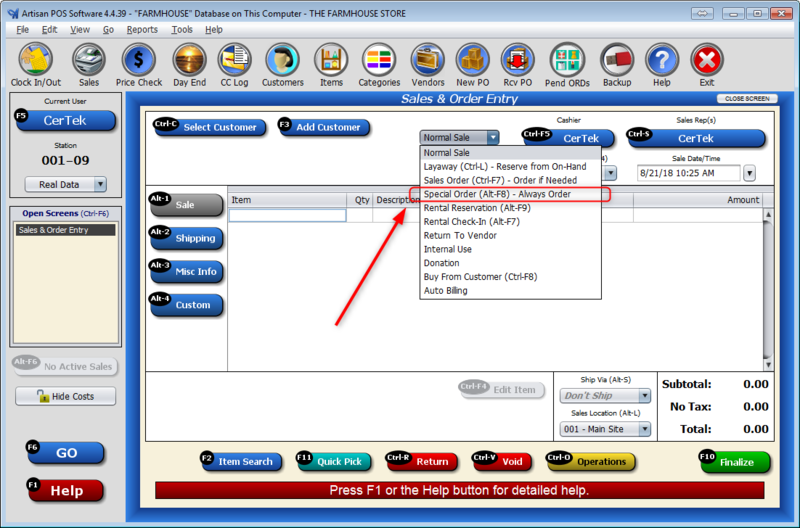 An order is placed in the Artisan Sales Screen with or without a deposit. A Purchase Request is generated which attaches the customer to the request for the item to be purchased. A Purchase Order is made that keeps the customer associated with item. The item is Received and a notice is made to the receiving clerk that the item was ordered for a particular customer. The status flag on the order has switched from W (waiting) to R (Ready). The list of Ready orders will now show this order. The customer picks up the merchandise and the order is marked delivered, even if they have already paid for the order. 1) An order is placed in the Artisan Sales Screen with or without a deposit. From the sales screen choose Special Order before during or after you have entered your items. Note: Every item on the sale will be special ordered, even if it is already in stock. 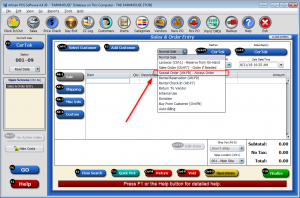 Use Sales Order instead of Special order if you have a mix of items. However if you are giving some items to the customer now and then ordering the rest, you should enter in a normal sale and then use a Special Order just for the ones you are ordering. The best practice for keeping tracking of your inventory is the finalize a normal sale for everything the customer is taking with them now. Use a Sales Order when some In-Stock items are going to be delivered to the customer when the Special Order is completed. Example 1: Sally orders a Couch, Love Seat, and Two Chairs. You have the Love Seat and 1 Chair in stock already. Sally wants to take the 1 Chair with her now and then pickup the Love Seat when everything is received. 1) On a Normal Sale, enter the 1 chair and finalize the order with 100% payment on her credit card. 2) Enter in a Sales Order with the remaining items and take a 50% deposit. Artisan will make a purchase request for the Couch and 1 Chair and put the Love Seat on Reserve. Example 2: Same example as above, but Sally wants to pay for everything up front with 1 check. 1) On a Layaway Sale, enter the 1 chair and finalize the order with 0% payment. 2) On a new sale, select Sally as the customer, select Sales Order as the sales type and enter the remaining items. Finalize this sale with zero payment. 3) Start another new sale and select Sally as the customer. Make Payments on both by selecting the transaction at the top of the sales screen and then click on the Pay button as indicated in the image. Select the Pay button for both the Layaway and the Sales Order and finalize and accept the 1 check (or credit card). 4) With the payment in full you will be prompted if the merchandise has been delivered to the customer. The prompt doesn’t tell you which item, but it does specify the transaction number. You can choose yes to the chair, but no to the sales order. It is easy to make a mistake if you have more than one transaction that you are paying for. It would be best to answer No to both questions and then manually mark the layaway transaction delivered. Since she is taking the chair with her now, click on the Layaway transaction and then click on the Deliver button. Note: It is important to know that Deliver means to give to merchandise to the customer in the store or wherever. It does not mean that you are actually transporting the merchandise to them. Delivery of goods is an accounting term that just means that the transaction is complete. Sometimes a customer may change their mind or the item of their affection is no longer available. In these cases the best way to handle the situation may depend on what stage you are in. In general you can recall the sale and made the necessary changes such as void one item off and put another one on. However you are not allowed to change a Special Order to a Normal order or similar sale type changes. In these cases it is best to void the Special Order and then re-enter the order as needed using Store Credit to store any deposits made and then apply that store credit to the new sale. Example 3: Sally ordered another chair. This chair is no longer available from the vendor and Sally wants to take the sales floor model instead. There is a discount on this one and Sally has already paid in full for the special order. 1) Recall the order and add the discount. When you save the sale there will be an over payment. Go ahead and save the sale and then you can refund the money to whatever payment, including Store Credit. 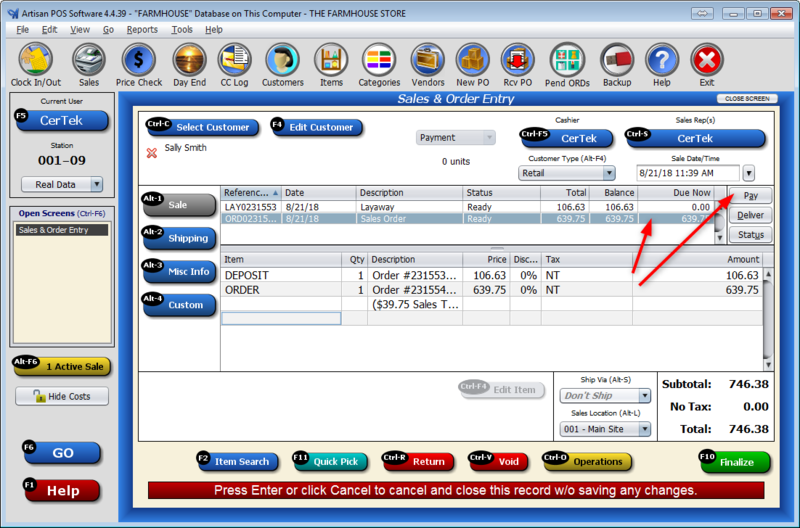 2) Mark the sale delivered by using the Deliver button on the sales screen after you have selected the customer. You will be prompted to over ride the Waiting Sale security check. Great care should be used when “Forcing Delivery” of orders, otherwise your inventory may have unanticipated results. This works as long as you have the inventory in stock at your location. It will pull from whatever inventory you have at that location. See the Multi-Store section below if you have more than one location. 2) A Purchase Request is generated which attaches the customer to the request for the item to be purchased. From the main menu click on Purchasing and then Purchase Requests. The items that are needed to be ordered are shown on the list. 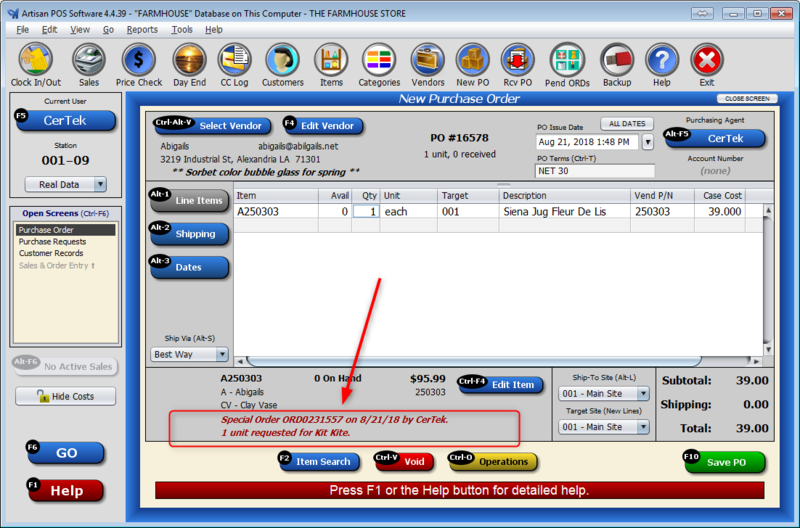 You can press Enter to start a Purchase Order for that item or you can start a Purchase Order and choose option 1 to include purchase requests on the order after you are prompted for the vendor. 3) A Purchase Order is made that keeps the customer associated with item. When you have the item on a PO, it will display that the item was requested for a special order and the details. 4)The item is Received and a notice is made to the receiving clerk that the item was ordered for a particular customer. When you receive an item that was on a special order AND that item us purchased using the purchase request, then you will get notified when you receive the item and the status flag on the order gets updated. 5) The list of Ready orders will now show this order. From the Go menu, Click on Order Status, then choose option 2. From here choose the order status you are looking for. For Orders Ready to Pickup, choose option 4. 6) The customer picks up the merchandise and the order is marked delivered, even if they have already paid for the order. Click on the Special Order transaction and then click on the Deliver button. If you are paying in full for the order, then you are prompted if the order has been delivered. You can’t mark an order delivered unless it is paid in full. If you want to collect payment from the customer later, you will need to use an Accounts Receivable payment type. If you have multiple stores and/or a warehouse location, then there are some extra things you may need to know, especially if you make an order in one location and deliver it from another. 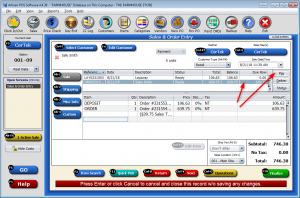 Make sure you can see Loc or Location as one of your columns in your Sales Screen. If not, you should right click over the blank part of the sales screen and choose configure columns. Then find Inventory Location field and move it over. It will appear as Location or Loc. Move it to a comfortable position, such as after the Item. IMPORTANT! This is the location from which the inventory is going to be pulled from when you mark this order delivered. For example, if you are pulling inventory from a warehouse from say site 003, and the sale was made at 001, then you should pull down this field on the sales screen and change it to 003. If you don’t do this, when you mark the sale delivered from site 003, it will make and out-of-stock correction at site 001 and then your inventory will still be at site 003. Think of it like this, a customer walks into your 003 location and makes a purchase. You would expect that this inventory would automatically pull from 003, which it does. Why would a special order be any different? If you are sending the customer to another location to pickup the merchandise, you need to specify that on the sale so Artisan will know where the inventory is coming from. If you don’t know at the time of the sale entry, you can always change it before you mark it delivered. This may be very important to you if all inventory is not the same. A floor demo model is not the same as brand new merchandise for example, even though it has the same Item Code. If you sold the demo model, you probably don’t want to give them a brand new one.